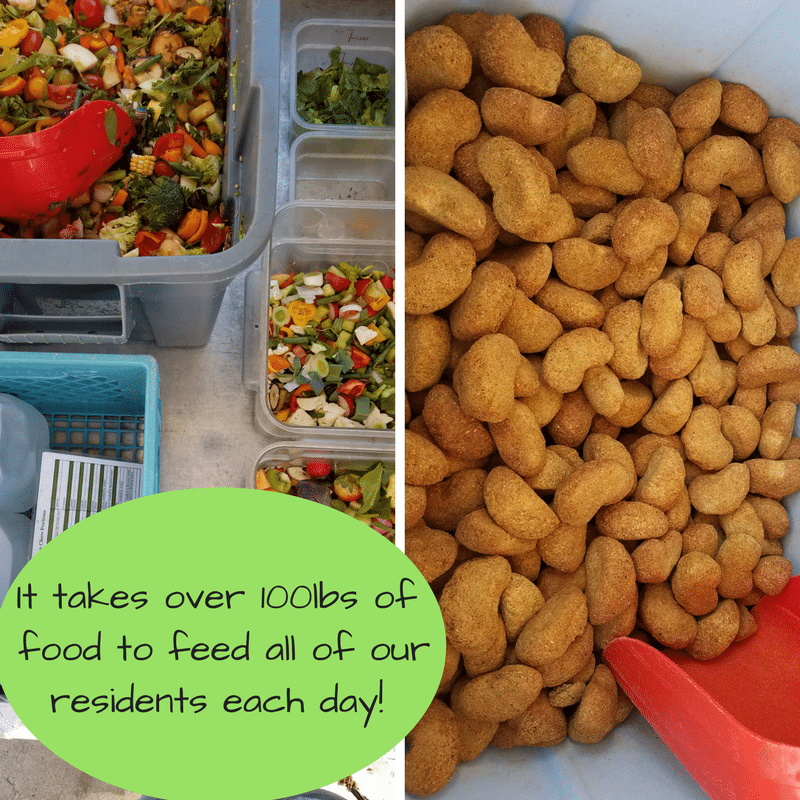 Here at the Primate Rescue Center, we process, prepare and feed over 100 pounds of food to the primates each day! Their diet consists of fresh fruits and vegetables, leafy greens, nuts, nutrient-rich chow biscuits and locally grown browse. The apes and monkeys are able to enjoy a delicious variety of foods because Whole Foods Market at the Summit in Lexington, KY donates a large variety of tropical and exotic fruits and vegetables. The primates really enjoy getting to taste and try new foods like rambutan, dragon fruit, jackfruit, tomatillos, malanga root vegetables and so much more! On top of all that, Whole Foods Market keeps the chimps well stocked with their favorite fruit…bananas! We are so grateful and humbled by the generosity of Whole Foods. 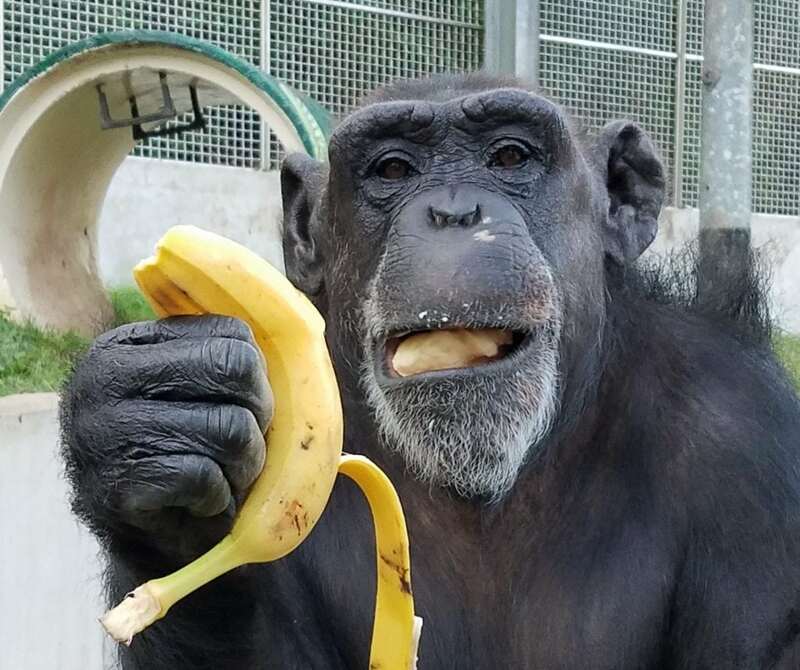 Not only do they keep the primates’ bellies full of tasty food, they have selected the Primate Rescue Center to be the benefitting charity of their Nickels for Non-Profits donation program. When you shop at their Lexington location in the Summit at Fritz Farm through the months of October, November and December of 2018, be sure to bring your re-usable bags with you when you check out. 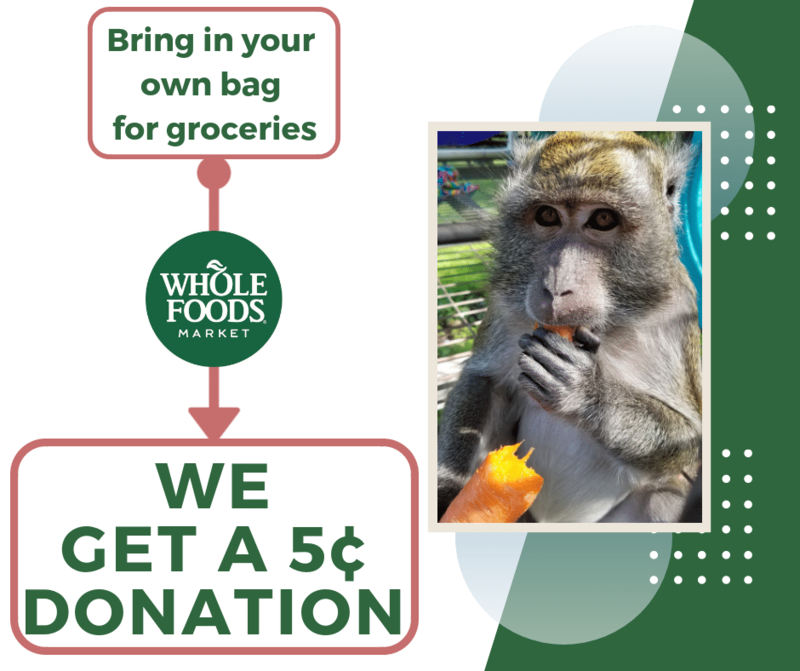 For each re-usable bag that you bring to bag your groceries, you can choose to donate 5 cents to the Primate Rescue Center! These small donations will add up quickly and 100% of the funds raised will go directly to providing quality care for the apes and monkeys who live at the sanctuary. We are so glad that Whole Foods Market selected us for this program and we’re grateful for the opportunity to encourage our supporters to go green with re-usable grocery bags! If you’re running low, you can order a pack of 10 re-usable grocery bags through Amazon here. The Nickels for Non-profits donation program starts October 1st and ends December 31st, 2018. If you are planning to do any holiday shopping or routine grocery shopping, be sure to visit Whole Foods Market at the Summit in Lexington, KY with your re-usable grocery bags in order to benefit the apes and monkeys of the PRC!